2 bedrooms, 2 baths, sleeps six, just steps away from Forsyth Park and so much more! Modern, eclectic, lavish, luxurious - those are just a few words that could be used to describe this unique and newly renovated, Southern home located just two blocks from Forsyth Park. 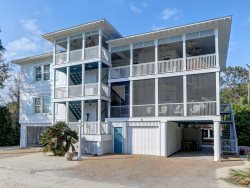 The beautiful Savannah vacation rental features 2 bedrooms, 2 baths, and sleeps a total of 6 guests in gigantic bedrooms! There's a stone patio to the side that offers guests the chance to catch an evening sunset while sipping sweet Southern tea. Guests will enjoy brand-new appliances as well as beautiful, modern decor throughout the property. This Savannah vacation rental features a full bath, a bedroom with two queen beds, living room, another bedroom with a queen bed, a full bath in the hallway, washer dryer, fully equipped kitchen with granite countertops and stainless steel appliances, and a breakfast table with seating for 4. In summary, the garden level has 2 bedrooms, 2 baths, and sleeps a total of 6 people and is just steps away from all that downtown historic Savannah has to offer including many great restaurants such as Local Ten Eleven, Leoci’s, and The Mansion on Forsyth, as well as easy access to trolley tours and shops. Join in on all of the jazz fest activities or one of the many other free concerts that the city of Savannah puts on in Forsyth Park. A nice walk will get you to River Street and a twenty minute drive will get you to Tybee Island to the beach for some fun in the sun. If you're looking for a fresh cup of coffee or shopping for groceries, The Sentient Bean, Brighter Day, and Kroger are all a 60 second drive away. Renting homes from Southern Belle is painless and professional. We take credit cards and require a $300.00 deposit to confirm the booking which is applied towards the remaining balance. For example, if your total is $1,500, we will take a $300 deposit and your remaining balance will be $1200. Thirty days prior to your arrival our booking software will charge the balance automatically. We also sell Traveler's Insurance which covers medical cancellations. The small problem with the TV was handled smoothly and efficiently. Better than expected, and for us, a great value with all the comforts of home and we didn't spend a fortune. We communicated completely via email and by website without a single phone call necessary. SBVR's detailed and informative email reminders allowed me to plan and proceed with travel plans, worry free! We had a blast in your charming and well located accommodation for our first ever visit to Savannah! Thank you for making the accommodation planning so easy! We hope to make it back again soon! The team members we dealt with were super friendly and helpful. They were extremely kind and informative at check-in. The property was beautiful and had historic Savannah charm with all of the amenities we needed. The property was in a perfect location, making our short walk to Forsyth Park and the local coffee shop one of our favorite things about our stay. Walt was very helpful, courteous, and quick to respond to inquires! Very pleasant staff. Quick response when we called with questions. We enjoyed our stay in Savannah! The place was perfect for our needs. We enjoyed the big kitchen and cooked a number of meals there. Great location. We would stay again. First call was a little frustrating. The property showed as open on the website and the gentleman I talked with said it was not. I called back and talked with Walt and got the situation settled. What a wonderful place! The key situation was a little confusing. We used our code and opened the door next to our property but found keys on a table inside the door. These keys were the ones we needed and we were home free! No other problems and the place was clean and comfortable. No noise issues at all.